This 1/4" mesh screen sample of Archaic Period bones came from one level in a test square at Modoc Rock Shelter. How do you think a zooarchaeologist would sort and identify them? Image taken by Bonnie Styles. 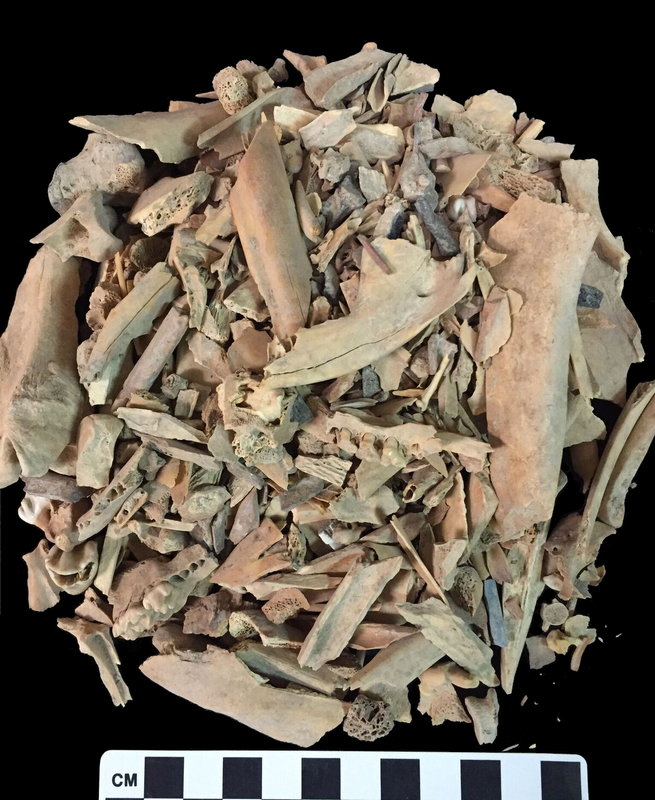 Bones and shells from archaeological sites are storehouses of information. We examine animal remains recovered at archaeological sites to find out the kinds and numbers of animals present. The conditions and modifications of the remains tell us about natural and human impacts on the bones and how the animals or bones were used. Bones and shells provide clues about hunting practices and fishing and collecting of a wide variety of animals. They tell us about diet, technology, and fashion, and special interactions with animals. They help us understand how people lived and interacted with each other and with other groups. We enter all kinds of information (data) about bones and shells into an electronic database for analysis.